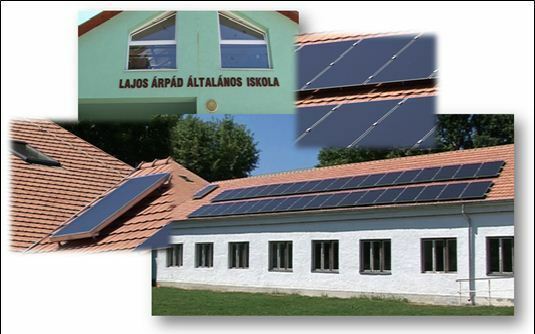 This project, implemented by BÜKK-MAK Leader LAG in Hungary, encourages the use of renewable energies in the area. Solar energy systems were set up in Community Energy Yards to produce electricity and solar thermal collectors to produce hot water. One of the key priorities identified in the local development strategy (LDS) of the BÜKK-MAK Leader LAG is to encourage the use of renewable energy and to increase energy efficiency in the area. Raising awareness amongst the local population on the importance of renewables is crucial to their success, therefore in the framework of the development programme „1 village – 1 MW”, 27 demonstrational Community Energy Yards with an educational purpose were set up. The objective of the project was to present - besides other renewable systems already in use in these demonstration yards- the use of solar energy in one of the Community Energy Yards and to set up a 5,04 kWp solar power system to produce electricity and a 800-1100 kWh solar thermal collector in order to produce hot water. The beneficiaries of the electricity and heat produced by these demonstration systems are the local communities and schools. The main activities undertaken were: a) the purchase of the solar power system to be set up in one of the exhibition yards (which are in continuous use so the project needed to be planned accordingly; b) the compulsory maintenance work of the equipment and c) ensuring distance supervision of the system. The produced energy is taken over by the local energy provider who deducts the amount of renewable energy fed into the grid from the school’s energy consumption per year. As a result of the project, the Community Energy Yards were created including a small solar power station where citizens can verify how this equipment works and how reliable it is. The energy produced by the solar power system is 5500-5800kWh per year, which is used in order to complement the school’s electricity needs. The other instalment produces 800-1100 kWh of heat energy in the form of hot water each year, which is used to cover part of the school’s communal water needs. The main challenge was to find a legal solution as to how the produced energy can be used for communal purposes. It was important to take into consideration the needs of the schools and other beneficiaries. The BÜKK-MAK LEADER LAG consists of 44 settlements and situated in North-East of Hungary.